With over 150 competitors, the Ms. Bikini America was a lot than a beauty contest. Winning the Tall Class was Australian Jacquii Alexander, a stunning 5'8", 120 lbs., 38 year old She is a very active lady who also competes in snowboard events and was a ballerina for 12 years. Jacquii has an MBA in strategic management and is an American Express operations director. Massachusetts Correction Officer Amy Guerin shed her uniform and took the stage at Ms. Bikini America where she was a Top 5 Finalist. The 5'2", 117 lbs., 29 year old has played field hockey through school and still is in a women's league and coaches a youth team. Amy was the '12 Model New England Champion and says that next season she will pump her game and perform in the Fitness Division for the first time. She explains, "Athletics run through my veins! I am looking forward to taking on a new challenge which will push me to another level. I want to step outside my comfort zone on a daily basis not only by doing fitness but on a daily basis." A declared lady jock, Kelli Coleman has just about done it all. Besides taking Ms. Bikini America, 5th Place Short Class, the 5'3", 110 lbs., children's camp director says, "It all started at the age of 3 when I began gymnastics and ballet. I am played many sports growing up including soccer and volleyball. I love training and staying in great shape and I enjoy challenging myself in the gym and exceeding personal goals." Kelli has her B.A. in Journalism from Northern Illinois University. Following her big win at Ms. Bikini Latina in Mexico City,Karimejaret Mareno Canche did not have any problems finding sponsors to compete at Ms. Bikini America last month in Las Vegas. The 5'2", 110 lbs., 27 year old social management assistant weight trains and does aerobics 3x per week. Karimejaret says, "I keep a tight diet all season, even during the holidays. Everyone in my home loves Mexican cooking, so I cautious when I sit for down for supper. I need to eat a little cleaner to stay in shape." Fitness America Pro Champion Stacie Venagro is overwhelmed and comforted by Else Lautala upon winning the show last month in Las Vegas. Stacie says, "This is the exact moment Fitness America named me the 2013 Pro Champ! This year was a tough one and there was amazing competition! I'm so blessed to have been crowned this title for two years in a row! The Rhode Island native is a lifelong competitive dancer who's taken her lifelong skills and opened her own dance studio earlier this year. The new Model America Champions Mark Robinson & Jessica Vasquez topped an amazing line of the world's most attractive sports models in Las Vegas last month. Mark traveled from Australia's Gold Coast where he does commercial modeling and provides personal nutrition services. Jessica is a Texas elementary school teacher and does models, runways shows and magazine photo shoots throughout the year. Texan Alina Adams has been training after work for a couple of years. But, at the urging of some friends the 5'6", 115 lbs, 28 year old bank recruiter recently entered her first show. So, Alina was a complete surprise when she walked on stage in Ft. Worth and won both the Ms. Bikini Texas and Model Texas Championships! The University of Texas graduate has a degree in psychology and says she just enjoys training to stay fit and healthy. 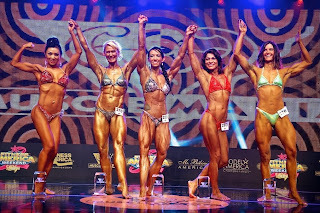 The Musclemania® America Championships hosted the best natural women bodybuilders in the world! Taking the show was an incredible Patricia Payne of Kansas City (C). The 5'3", 115 lbs., 39 year old trainer is a 3x Musclemania Champion as well as 8 other major international titles. Pat and her husband, MM Pro Law Payne, are sponsored by Nutrabio. Placing at the show (L-R) Eunju Bae (5th, Korea),Melanie Redington (3rd, Alaska), Martyna Sarozi (2nd, Spain) and Celine Ruchard (4th, Switzerland). The Ms. Bikini Central America in September was Guatemala's hottest ticket in town with an audience dressed for a classy night out. The Top 3 Finalists included Hamy Nataly Tejeda Funes 3rd, Damaris Vides Orellana 1st, and Remata Nesquita Arcanjo 2nd (L-R). Next season's show will also feature a new Fitness Fashion Show and open to all fitness women throughout Central America. As an all around athlete, Chantelle Cooke keeps active all year. And, as a audience favorite at Ms. Bikini Canada in Montreal, she had a blast on stage. The 5'7", 125 lbs., 28 year old native American Indian works at the Akwesasne Mohawk Casino Resort in upstate New York. Chantelle is a single mom with two kids at home and enjoys riding her motorcycle license, deer hunting every season and loves fishing, mountain climbing & kayaking. The Fitness America Weekend™ Team Champs was just awarded to Team Australia, a hotly competitive group of 6 competitors who accumulated 95 points by winning multiple classes or divisions. Top Aussie point winners included new Ms. Bikini America™ Hattie Boydle (27 points), Ms. Bikini and Model Classic Winner Kristen Lonie (20 points) and Musclemania® World Champion Nathan Wallace (20 points). Other Top 5 Teams including Team Savage Warrriors (2nd Place, 82 points), Team Korea #1 (3rd Place, 71 points),Team Australian Natural Bodz (4th Place, 65 points) andTeam New Mexico Iron (5th Place, 60 points). Complete placings and scores are available here. Competitors can represent a trainer or coach, local, regional or national fitness centers, sports clubs or other companies and national teams. Teams can be composed of 3 to 10 people and each with a team leader. Each team may have competitors that are competing in different classes and divisions. And, if a team gets too large, then they can split and form two or more separate teams. With over 100 of the world's most attractive, healthy and elegant ladies on stage, last month's Ms. Bikini America was a weekend of living beauty. A bevy of veteran competitors and first-timers relished in the excitement which included judges from Hollywood, New York, Miami and Las Vegas. The sports fitness, lifestyle and consumer media recorded everything and shot many of the ladies outdoors, in temporary, on-site studios and at local fitness centers. Over 25 magazines were represented and a few had multiple photographers shooting throughout the weekend. 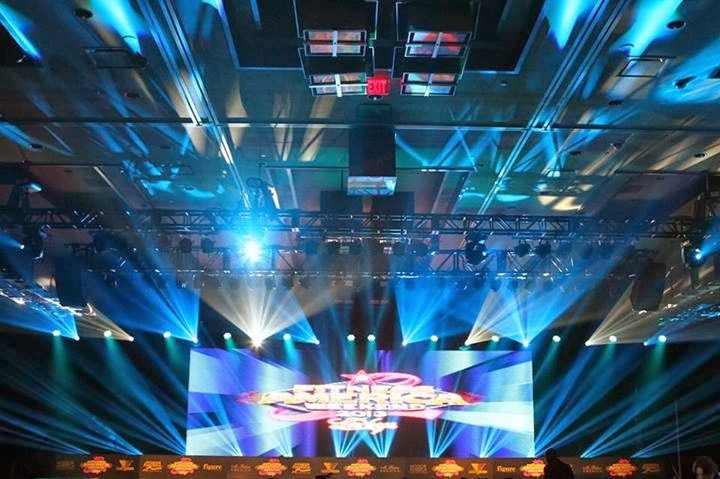 The insane, world class lighting at Fitness America Weekend™ last weekend in Las Vegas made every competitor look like a star! The pulsating production was designed specific for each competitor according to their apparel and music beats. "It is like performing at a rock concert", said one of the fitness competitors. The lighting director and his team worked tirelessly for four days installing and programming the systems and then testing with some of the competitors. It all went to the producer's motto to, "Make every competitor feel like a star!" 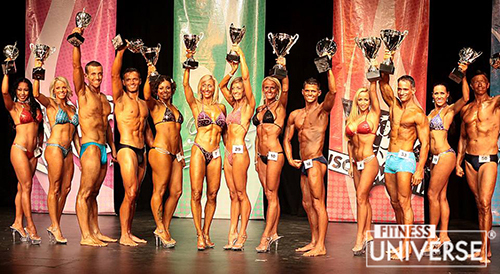 Team Finland Fitness rocked Las Vegas last weekend! Former Fitness America™ Champion Else Lautala (R) took 2nd Pro, Sofia Ruusila-Nousianen (L) was a Model America and Ms. Bikini America Class Winner and Elina Tervo (C) took the 2nd Ms. Bikini America and 6th Model America! Else has been competing in Fitness America for over 10 years and now she will be promoting the new Fitness Helsinki.Championships next February. "I am so excited to bring home the show that I have performed at for so long," Else expressed. "Everyone in Scandenavia is so excited." For the past 3 years, Amy Guerin has been competing on Fitness Universe stages. And, although it's been a dream of hers to step on a national stage, she just hasn't been able to reach that goal yet. Well, that is about to change with her sights now set at Fitness America Weekend in Las Vegas. Following an impressive win at Ms. Bikini Superbody in Atlantic City, Amy's bumping up her game. She explains, "It has always been a dream of mine to be on stage with some of the most beautiful women and athletes out there. I promised myself I would bring my best package to the stage and I would know when I was ready. The time is right! I am eager to stand proud on the stage with the improvements I have made in my body." The former collegiate field hockey player and has demonstrated an inner zeal to meet the challenges and rigors of day in and day out training. Amy says she's never felt more motivated to continue her journey and be challenged at a new level. Figure Universe™ Natural Pro Jessica Rinaldi has long earn her reputation as a premier sports fitness star. But the New Mexico trainer and husband Mike Donathan are training an impressive group of fitness competitors whom pose to be a formidable force at the Fitness America Weekend. Jessica says, "We are newly motivated and our mission with Team New Mexico girls to again dominate the stage. We have some of the top coaches and athletes leading NM and we will come with quality dedicated competitors. I am very proud be be a part of Team NM and our affiliates in MN with Perfectly Prepared." Included in Team NM are Tara Thatcher, Tarah Andrews, Nick Roybal, Nicole Leyba, Lea Archuleta, Siobhan Herrera, Eman Lucero, Stefanie Poulin and Dacia Rusick. Congratulations Laura Tarvell who just won both the Ms. Bikini and Model Canada last weekend in Montreal! At 5'10", 140 lbs., the 33 year old mother of two sets of twins was stunning beautiful on stage and one of the highlights of an amazing show. Laura owns a Pilates studio and is a former school music teacher. She was a college basketball player while earning a BA degree in music. With nearly 150 natural competitors from throughout Europe and America, last weekend's Fitness Paris show was an electric show! Held at the awe inspiring Cite de Sciences Amphitheatre the performances were outstanding and talent among the best seen in Europe in many years. Australian sports fitness model Renee Brady will bring her exotic appearance to the Model Australia & Ms. Bikini Australia this month on the Gold Coast. The 5'9", 134 lbs., 21 year old personal trainer and lifestyle coach has already won two major regional model shows, so stepping on the Fitness Australia stage could be a major jump to her competitive career. Renee says she loves all outdoor and water sports, traveling and very passionate about her training and living a healthy lifestyle. Team Finland star Camilla Karjalainen will be among an amazing pool beautiful talent competing at Ms. Bikini Paris in Fitness Paris in two weeks. The popular Scandanavian sports fitness model current appears in a new Tapout television commercial and also appears in numerous magazine features and advertising campaigns. At 5'2", 105 lbs., 31 year old radio host and fitness model is very athletic with a extensive experience in ballet training, ice skating and muy thai. Over 150 competitors will be on stage with Camilla in Paris. Catch the broadcast action LIVE from Paris, France on October 12. Former Ms. Fitness World and Fitness Universe Top 5 Finalist Vanda Handarean says she's training a team of junior girls for Fitness America Championships in Las Vegas next month. The former Romanian Olympic gymnast has incredible knowledge and experience and no doubt her girls will benefit from Vanda's coaching and will leave the audience in awe. "I have been working with them and teaching how to perform not just in the gym but perform in front of a live audience," Vanda says. Vanda owns her own training facility in Ottawa, Canada. Figure Universe Natural Pro Paula De Markey says visualization is what helps make her achieve her goals. The '13 Figure Universe Master Class Champion is always a tenacious and positive influence at shows both on and off-stage. Paula explains, "It took a lot of focus, hard work and truly believing in myself and visualizing my dream to become Figure Universe Pro." Paula not only achieved her Pro status, but she also received the highest score of all 43 competitors in her class on stage in Miami. "I like to create a vision board, feel & see myself accomplishing my goals!" The Massachusetts native says, "I am excited to see other competitors’ dreams come to fruition." So, being an award presenter at Fitness Boston this weekend will bring it all full circle for Paula. Miss Uruguay Patricia Callero came to the Superbody Championships yesterday in Atlantic City and made the judges gasp. The 5'8", 125 lbs. beauty queen was competing in a fitness show for the first time and won both the Ms. Bikini and Model Divisions. Patricia is a college student and professional model and knows how to present her sass. But, she realizing that to move forward in fitness shows, she needs to get into a little better shape. "I realize that I need to tighten up a little and spend more time doing cardio. I'll do it and be ready for Las Vegas." Lexine Kolb is the newest Figure Universe Natural Pro. 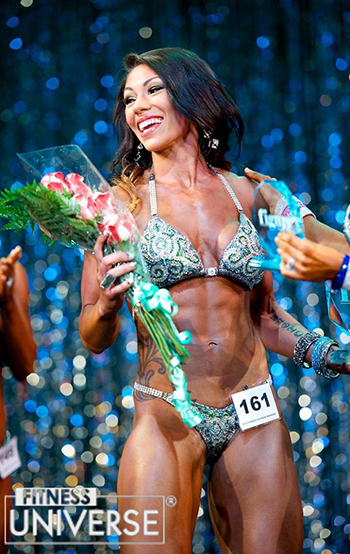 The Pennsylvania native surprised even herself last night at the Superbody Championships by winning the Masters and overall title. The 46 year young mother of two teenagers thanks her husband David for his support. Maxine compete in ballet for 15 years was she was younger. She says, "I started competing at 40 and love to improve myself each day. I try to teach my kids this also to prepare them for their life ahead." Lexine is always a lot of fun at the shows and great role model for the younger gals stepping on stage. Congrats to Carolina Beginner Champions! Held last Saturday in Charlotte, the annual camp style show welcomed first time competitors and introduced them to an exciting stage experience. Winners included Thomas Tourville - Musclemania®, Michael Brickhill - Model, Eve Freeman - Ms. Bikini™ & Model, Renee Sanders & Jennifer Kasmer - Figure Masters & Open and Marcy Lee - Fitness. Remaining Beginner Shows this season include Boston (Oct 5) and Ohio Valley (Oct 19). Earlier this year Figure and Fitness Universe Natural Pro Bethany Nelson visited Albuquerque as a guest speaker at a competition prep seminar and the guest performer at Fitness New Mexico in June. She made the crowd roar in excitement with her "Toxic" fitness routine and left a lasting impression with the competitors she got to know back stage. A special connection from New Mexico to Minnesota had been made and now the ladies want more! A group of fitness competitors teamed up and invited Bethany back for one of her special Team Peanut fitness prep camps yesterday. Bethany says, "I was talking to a friend of mine from New Mexico and encouraged her to come out to Minnesota for my prep camp. With traveling being so expensive the trip would be super difficult. So, I told her to rally a couple of friends who would want to attend my camp and I would fly back!" Bethany will be coaching on nutrition, training, posing, modeling and especially positive self-image exercises. What a great way to continue the "fitness bond" between women who enjoy competing! Bethany will also be competing in the Figure and Fitness Universe Natural Pro Championships at Fitness America Weekend in Las Vegas in November. New York trainer Jodi Mehan says she's on a mission to teach people that discipline is the guardrail on the journey to self esteem. As the owner of Challenge by Choice Training, she has recently added the challenge to her trainees to actually compete. Jodi's studio is home to instructors who have all competed. Jodi explains, "I know how fulfilling the journey to the stage can be! teach class and sass to all need to learn presentation in competing. Most of all, it is the gratification if reaching the goal and the fun had at the amazing events Fitness Universe puts on!" Jodi's next competition outing will be Superbody in Atlantic City this Saturday. You can watch her and all of the talent on stage, LIVE at 6 PM ET, 3 PM PT. New Mexico bombshell Danielle Duran had some exciting news last week. "I am beyond honored to share that I was featured in the August, Swimsuit Edition of Fitness Gurls Magazine," she announced. "I am grateful for the path that Fitness Universe has lead me on with fitness which has allowed me the privilege to meet and work with so many talented artists in the industry! Featured here in an outstanding image by LGFX, Danielle will appear at Fitness America Weekend in Las Vegas in November. Figure Universe Natural Pro Jessica Rinaldi Donathan was stunning at the Miami Beach show and easily winning the world class line-up. But, it is not enough for the Albuquerque mother who's training for Figure America Pro Championships in Las Vegas in November. Jessica says, "I am very excited about this next show. Fitness America has a lot of wonderful memories for me and I always enjoy my prep during this time of year. I love my winter squash as one of my prep staples and they are now getting to their peak season. Also I have cut my steady state cardio out and this prep will be relying on interval stairs, sprints, HIIT and heavy resistance to bring a sleek athletic shape to the stage for my 2nd Pro Show. I never want to come in the same and am maintaining good shape and muscle mass so my challenge this time is to do what I love and come in the leanest I have ever been. 12 weeks to go!" Bulgarian rhythmic dance coach and professional performer Silviya Taseva moved to the USA 10 years ago and has never looked back. Soon after arriving in America, she because a gymnastics coach and currently trains girls for national level events Based in New York City, Silviya is training for Fitness America Championships in Las Vegas. "I plan to use all of my experience in dance, gymnastics, acrobatics and choreography into making an amazing performance," she says. '09 Ms. Bikini America Mari Kasvi may not be planning to take the stage again anytime soon, but the Finnish model says, "I am enjoying my pregnancy, a sort of competing in my own fitness competition." Mari has appeared in dozens of commercials including Pepsi, Maybelline, Live Nation and many more, but that's on hold for bit longer. Mari explains, "This fatness has not really got me at all. I am 8 months pregnant and still training, although not like for a contest. And, I admit I have some cheat food more than usual. It's helping to keep me sane during the pregnancy." But, Mari says, the real test will come once she has the baby and wants to get back on stage. "That will take some time." 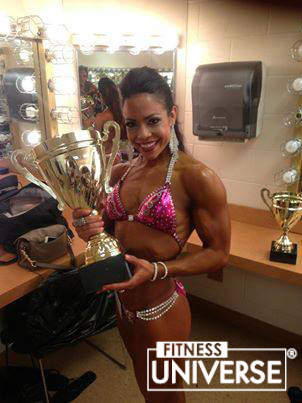 Congratulations to Janelle Tapia who won the Figure Mid America Championships! The New Mexico fitness trainer competed in her first show in June surprising the home town fitness community. The 5'2", 115 lbs., 24 year old is now Figure Universe Natural Pro qualified and will make her debut at Figure America in Las Vegas in Las Vegas. Sports fitness model Nikol Krcova is the reigning Ms. Fitness Slovakia. The 5'3", 120 lbs. technical school graduate is training for both the Fitness Paris and Fitness America Championships this fall. Nikol has been an athlete since school days including track, volleyball and water polo She began training for and competing in fitness shows when she was just 20 years old and says she enjoys more than any other sport. "It gives me such a charge being on stage and performing for people," explains Nikol. We will see that energy on stage in Paris in October. The new Fitness Mid-America show in Kansas City will feature a bevy of new and refreshing fitness talent. One of the most exciting is Abigail Kluttz, a Kansas nutritionist who is applying her professional knowledge into competitive scene for the first time. At 5'10", 130 lbs., she was collegiate basketball player and coach while pursuing her Bachelor Degree in English Literature and Communications. Abigail says she has a "passion for speaking to women on self-esteem and health. Married and the proud mother of a 15 month old, she will appear on stage primed and ready in the Figure and Model divisions in two weeks. As a track and field athlete, Brittany Noelle says she was intense competitive and disciplined. Now, the 5'6", 130 lbs., 23 year old UCLA graduate is turning her competitiveness to fitness competitions and will be on stage at Ms. Bikini Southern California with her BS degree in Physiological Science, Britanny is a personal trainer at Equinox Fitness. She is also a former Miss Califronia USA, Miss Regional California USA and Miss Malibu USA competitor. Britanny says she's also a fitness, lifestyle, and commercial model. It could easily be said that Ms. Bikini New England Classic Winner Jodi Mehan injects any theater where she competes with a huge dose of excitement and energy. The 5'1", 120 lbs., 40 year young mother of two beautiful daughters says they are the ones where she gets her enthusiasm is derived. Jodi has her Bachelor of Science degree in cardiac rehabilitation from Ithica College and owns Challenge by Choice Training. Jodi says, "I was a dancer all through high school and entered college a communications major and dance minor." She will step on stage again at the Superbody Championships in Atlantic City on September 7 and will bring another dose of her effusive personality. 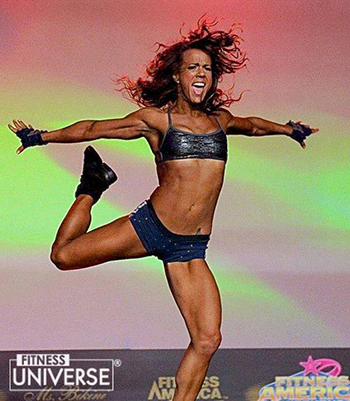 Fitness Universe Natural Pro Else Lautala was the '07 Fitness America Champion and has been a Top 5 Finalist at the Fitness Universe Championships for many years. But the former professional acrobat from Finland also competed in the Ms. Bikini Universe last month. "It was something I thought about a lot for a couple of years," Else says. "So, the time was right. I thought my diet was good and body was ready for it." And, the decision paid off with Else capturing 5th in Fitness Universe and 2nd in Ms. Bikini Universe Medium Class (of 33 competitors). Besides Else, Finland had an impressive team of 5 competitors in Miami Beach. The Fitness Europe Championships in Rome last month featured the best natural fitness athletes on the continent. Championships included Sarah Hoey, Germany (Ms. Bikini™ Short), Minna Ronkonen, Finland (Ms. Bikini™ Tall), Elsa Hirvonen, Finald & Kamal Amroche, Italy (Model Women & Men), Ana Zujovic, Finland (Fitness) and Simon Panda, England (Musclemania®). As one of Britain's hottest fitness competitors, Emma Louise Burrows brought her stage game to Ms. Bikini Universe last month in Miami Beach. She says, "I was incredibly proud to represent the UK and placing 8th at the show. The standard of girls was exceptional and I am so happy with the me I took to the stage and that I was able to put on a show worthy of a top ten placing against such fabulous girls from around the world." Emma will be on hand at Fitness Britain on September 21 in London. And, the winner is . . . again . . . Anca Bucar! The two time Fitness Universe Champion Just seems to get better with every appearance with imaginative routines, energy and a personification of true athleticism at its best. Complete Fitness Universe Weekend results, photos and archive videos are available at here on this website. As one of the industry's foremost cosmetologist, Jenny Karl Hair & Make-Up Agency has proven to be a big resource for Fitness Universe competitors. And, as the exclusive make-up service provider at the Universe, America, Superbody and other FU shows, her teams of experienced artists make those secret, unlicensed scammers look like amateurs. Jenn says, "We really go beyond what the wannabe make-up people do. We're among the few that take the time to apply the magic of airbrush!" And, Jenn's teams provide all the make-up supplies any competitor could want or use including lip gloss, foundation, eyelashes and more. "We include all of that in our rates. You only have to bring yourself!" 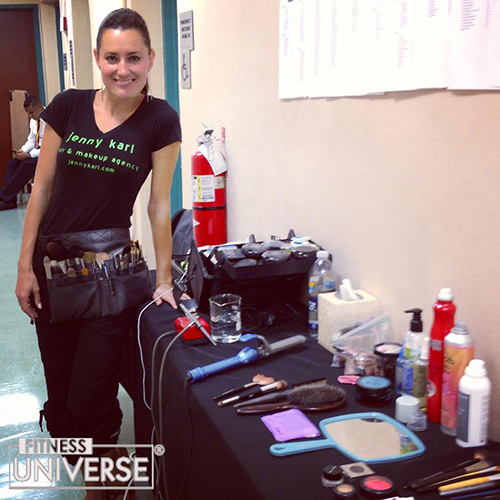 At the recent Fitness Universe Weekend in Miami Beach, the unlicensed people couldn't help their clients because they were stuck, hiding in a hotel room 10 minutes away while Jenn's clients were being getting all fixed up and touched up backstage through the weekend. Jenn says, "We really take an interest in our clients and not only make them look their best but are as excited about them winning the show as they are." New Figure Universe Natural Pro Champion Jessica Rinaldi dominated the Miami Beach show with incredible shape, condition and presence. The New Mexico star was recently married to long time boyfriend Mike Donathan who is also Jessica's trainer. 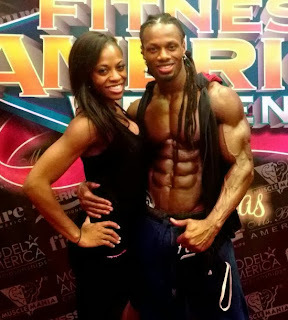 Kudos to newly crowned Model Universe Classic Champion Jacquii Alexander of Australia! The veteran model says she does it all for the fun of it. Jacquii is an American Express Asian Operations Director and a property investor. But, come weekends, she's either competing in snowboard events or in sports modeling shows. At 5'8", 120 lbs., Jacquii says she's been athletic since childhood including 12 years as a competitive ballerina. She will be a special guests and presenter at Fitness Australia on the Gold Coast in October. Selected as Ms. Bikini Universe and Model Universe Champion, Korean Do-Yea Kwon was a popular choice among both the audience and judges. The 5'10", 128 lbs., 27 year old fashion model traveled from Seoul to Miami Beach with Team Korea. After the show, Kwon spent the week celebrating her honeymoon with her groom. Do-Yea says, "I was so overwhelmed when I won." She was part of a 25 member Team Korea delegation which won in so many categories throughout the weekend. With two Fitness Korea shows now produced each year, over 400 competitors participate at each show! 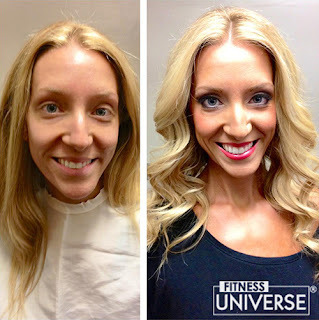 The before and after of Ashley Berry at Fitness Orange County in May is startling. Jenny Karl Make-Up Services were available at the show so competitors could be treated and touched up from arrival and throughout the show. Their exclusive services will also be available at the Superbody and America shows this fall. Pennsylvania housewife and mother Lexine Kolb is coming to Miami Beach this week for the Fitness Universe Weekend. The 47 year old home based business women will be on stage in the Figure & Ms. Bikini Universe. "I started competing 7 years ago and love it!," Lexine says. "My goal is to inspire women at any age. Iam proof that it's not too late to start something and reach for your goals by working hard. I love when people approach me and ask how I do it and can I help them. That makes it all worth it! Helping others. I enjoy meeting so many others at all the shows." And, will 400 competitors at the Universe, Lexine will have plenty of new friends to make. Watch the show LIVE on www.fitnessuniverse.tv on Friday and Saturday, 9 AM - 10 PM ET. ABC’s “Bachelor Pad 3″ Winner Nick Peterson may have won $250,000, but he’s not stopping his media roll. The 27 year old, Florida actor and model was also on Season 7 of “The Bachelorette” and will be on stage at Model Universe Friday & Saturday with 100 other amazing sports models. Watch the show LIVE on www.musclemania.tv. Figure Universe Pro Michele Welcome is on a mission! The Snap Fitness francise owner says that her health movement just went even bigger. Michele announced proudly today, "Now in addition to my breakfast, lunch, and dinner menus at the exclusive restaurants in my community, I've partnered with the best supermarket in town - Shop Rite Supermarket. Together, we have launched "The Michele Approved Custom Grovery List!" Michele explains that now fitness minded shoppers can walk in, grab her categorized list and find all my approved healthy proteins, starches, fruits, veggies, spices, super foods and more! Just look for the "Michele Approved" aisle tags throughout the store to make all items easy to identify! "I'm on a mission to make living a healthy lifestyle easy," Michele states. "No more bland food diets! Spread the word!" Michele will make her Figure Universe Pro debut in Miami Beach this month. You can watch her and all of the two-day long fitness extravaganza from anywhere in the world LIVE onwww.fitnessuniverse.tv on June 28-29.